Boyd Exell from Australia has been on the hunt for a gold medal in four-in-hand driving for many years and at the Alltech FEI World Equestrian Games in Kentucky it finally came together for him. After a World Record dressage test and third place in the marathon, Exell drove a safe cones course and won his first individual gold medal. 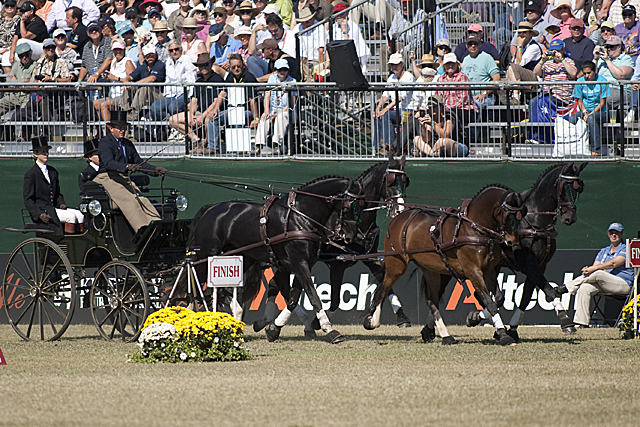 Dutch driver IJsbrand Chardon took the silver; with the bronze going to USA’s Tucker Johnson. The Dutch team won the gold, ahead of the USA and Germany. Today was another drama-filled day in the full Driving Stadium as there were problems with the timing system half-way through the competition. Team drivers Ludwig Weinmayr from Germany and USA’s Chester Weber had to leave the arena while the repairs were done. Weber was the first driver to go after the enforced break and the 35-year-old multiple US Champion showed his professionalism by driving the first double clear round of the day despite the long wait. His compatriot James Fairclough followed him and did the same to secure team silver for the USA. After watching Chardon’s dressage test, Exell thought he would have to fight for silver at the Kentucky Horse Park, but his horses clicked into gear in dressage in which he set a World Champion record score of 30.08. After the marathon Chardon piled even more pressure on Exell and the difference between the top drivers was only 1.72 penalty points. Chardon made Exell work very hard throughout the week and the professional coachman and horse trainer told himself every day that he had done a bad job in order to sharpen himself for the next day. After Chardon hit one ball in the cones course, Exell decided to drive safely. He crossed the finish line with a few time penalties, knowing that this would not endanger his gold medal. Tucker Johnson had one ball down, but this did not jeopardise his first ever-individual medal at a World Championship. Johnson was a member of the US pair team that won gold at the 1991 World Pairs Driving Championships in Zwettl and he contributed to the US silver team medal at the World Equestrian Games in Jerez 2002. Tucker was extremely pleased with his horses and his result and will now have more time for his family and his business. There was a clear ‘no’ when he was asked if he would not reconsider his decision to retire from combined driving after having won a medal. The Swedish team were in the bronze medal position after dressage and marathon with top drivers Tomas Eriksson and Fredrik Persson finishing second and eighth in the marathon. Persson was first to go and picked up just 0.56 time penalties. Tomas Eriksson was well on his way to secure their bronze medal, but the 1990 and 2000 World Champion took gate 19 from the wrong side, which eliminated him and the Swedish team from the competition. Thanks to the clear round of multiple German Champion Christoph Sandmann, the German team moved up to bronze.